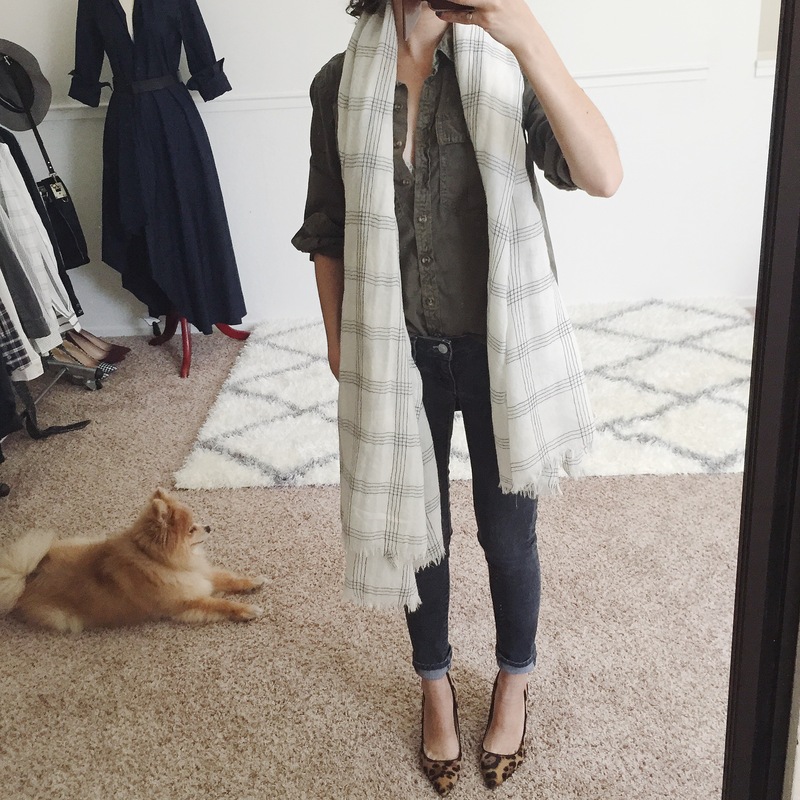 Last fall I fell so in love with this scarf, I picked it up in both colors (off-white & navy). 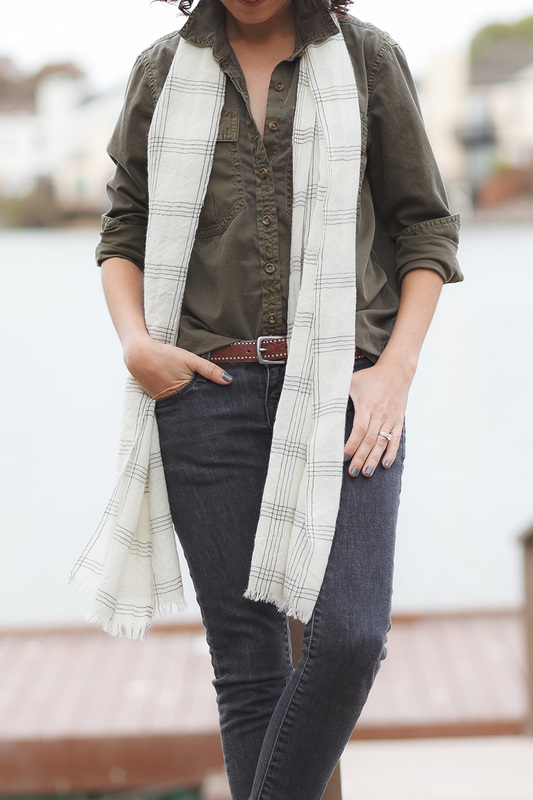 It’s a super soft, gauzy, 100% wool in a simple check print that goes with everything. Sold! There was just one problem…it was too wide, so that no matter how much I folded, twisted or wrapped, it always looked too poofy on my petite frame (I don’t look good in an oversized blanket scarf unfortunately, even though I love them, like this one…but I just have to tell myself, “no!”). There was just too much fabric, and it quickly overwhelmed me anytime I tried to wear it. The obvious solution was to cut out some of the width, and it took this long for me to grow the nerve to actually take a pair of scissors to these beautiful scarves. The weave is loose and gauzy, so I didn’t want to sew a hem (seemed like a difficult job), so I picked up a bottle of Fray Check to protect the cut end from unraveling. 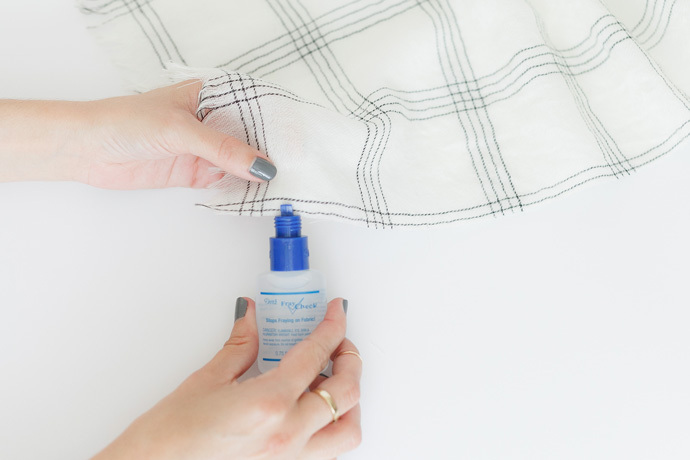 Fray Check is a launder and dry clean safe fabric glue specifically marketed to prevent fraying and unraveling, which seemed like the perfect and easy solution for this project. I folded the scarf in half length-wise to identify the center. I took a sharp pair of fabric scissors and carefully snipped the scarf in half. I ran a light layer of Fray Check along the freshly cut edge and let it dry fully. I placed plastic bags beneath the scarf for applying the Fray Check so nothing would accidentally stick. 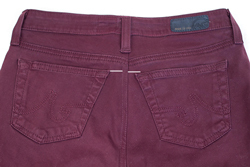 The dried Fray Check feels a little crunchy until you scrunch it up a bit. I just twisted and scrunched the scarf in my hands a few times, which helped get rid of some of the crunch. 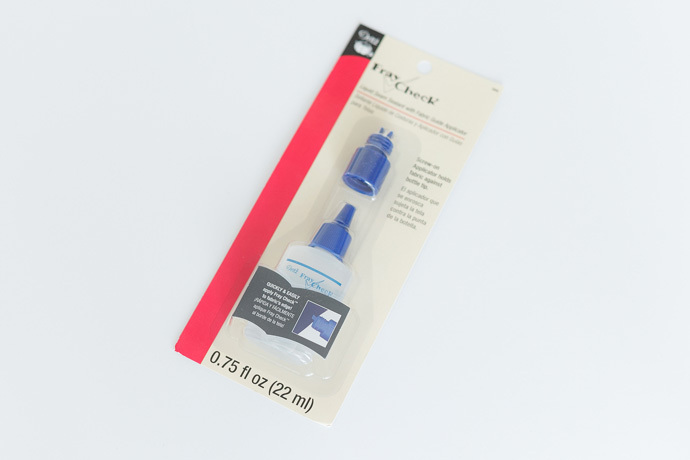 Anyone know of any other good uses/projects for Fray Check (this is my first time using it)? I’d love to hear them! I’m definitely going to try this — I’ve got a couple of scarves I just about gave up on wearing! I feel in love with blanket scarves over the winter and although I purchased a couple, I found that I never wore them, due to the volume overwhelming my smaller frame. I finally bit the bullet and cut the scarves in half and removed a few rows of the yarn/thread along the cut edge to fray the edge (the same as the original edge). 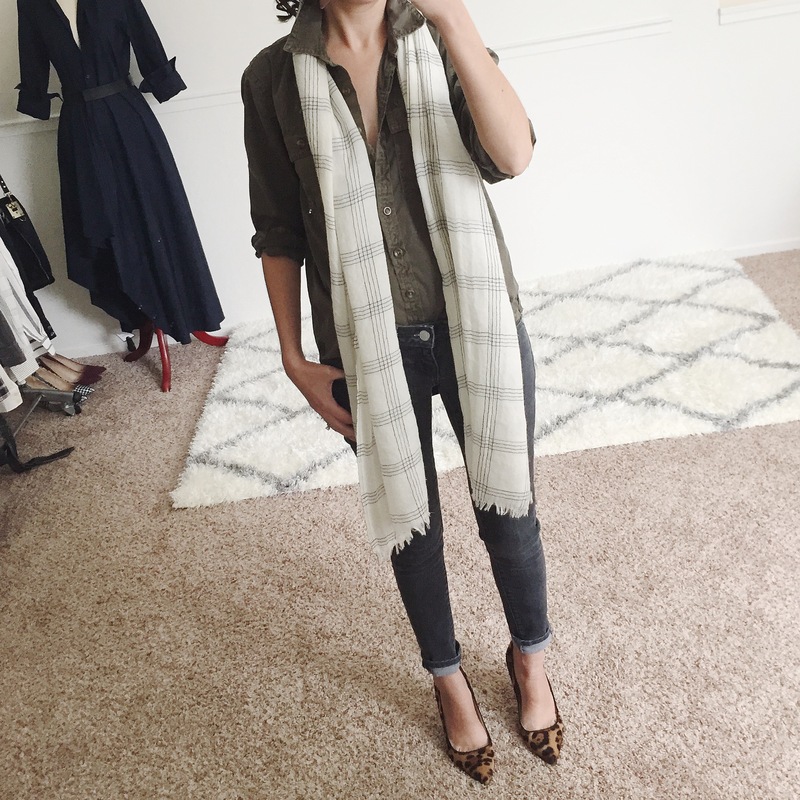 It ended up working out perfectly for me and found that I wore the scarves all of the time after eliminating all of the bulkiness! I’m definitely going to have to try your method with the thinner scarves that I have (and haven’t worn). I love the “poofy” scarf look, but maybe this more has to do with the fact that I come from a much cooler climate, poofy=warm. The thinning out is a great idea though, but I don’t think I’d have the courage to cut! 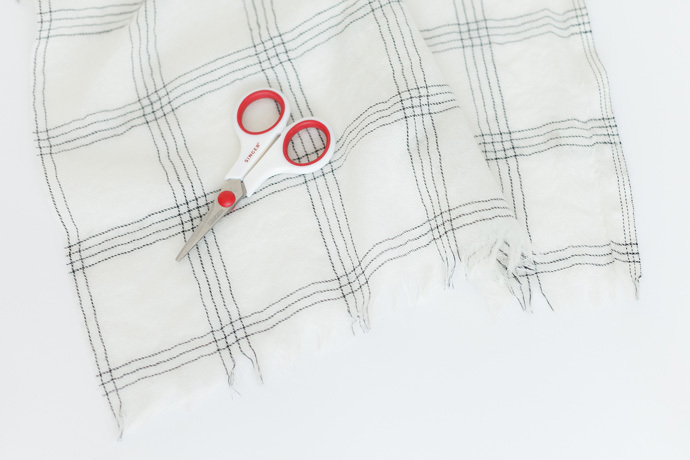 Even when I’m sewing something together or just simple hemming, I dread using the scissors, probably due to fear of regret. Great post, Kelly! And I know just what you mean! It took me all fall/winter of sadly watching these scarves go unworn to finally get brave enough to chop them up. So scary! Great post, love the end result!! I am shortish and often have the same issue! Thanks for the fabulous tip!! I found you via Already Pretty. I own this exact same scarf and haven’t been wearing it because it’s too bulky. I haven’t cut it for fear of failure. But I’m not wearing it now, so what do I have to lose? Thanks for the article. You have encouraged me. Great idea. This is the easiest alteration ever and it’s no-sew. I never thought of using Fray Check on the edges of scarves. Thanks for this post. Cool! What would be the ideal width for a scarf for a petite? Some scarves are wider, some are narrower. It would be nice if you can share the maximum and the minimum width of a scarf that works for you so far. Thanks. Hi Cindy! That’s kinda hard to say because I know petites who can rock oversized styles and others who look overwhelmed. There’s really no rules, just a personal preference. That said, I’ve observed having average to wide shoulders and long, thick hair helps a wider/oversized scarf look good on a small frame, while narrow shoulders and shorter/thinner hair can make them harder to wear. I’m of the latter, so I prefer a thinner scarf on my frame. Best of luck!